Knowing that the end of His life was near, Jesus Christ led His Apostles to the Garden of Gethsemane on the Mount of Olives. He told them, “Sit ye here, while I go and pray yonder” (Matt. 26:36). Then, after He left them and kneeled to pray, He suffered great pain for our sins. The pain was so great that He pleaded, “Father, if thou be willing, remove this cup from me: nevertheless not my will, but thine, be done. After hanging on the cross for six hours and enduring intense pain, the Savior said, “Father, into thy hands I commend my spirit” (Luke 23:46). Then He bowed His head and died. 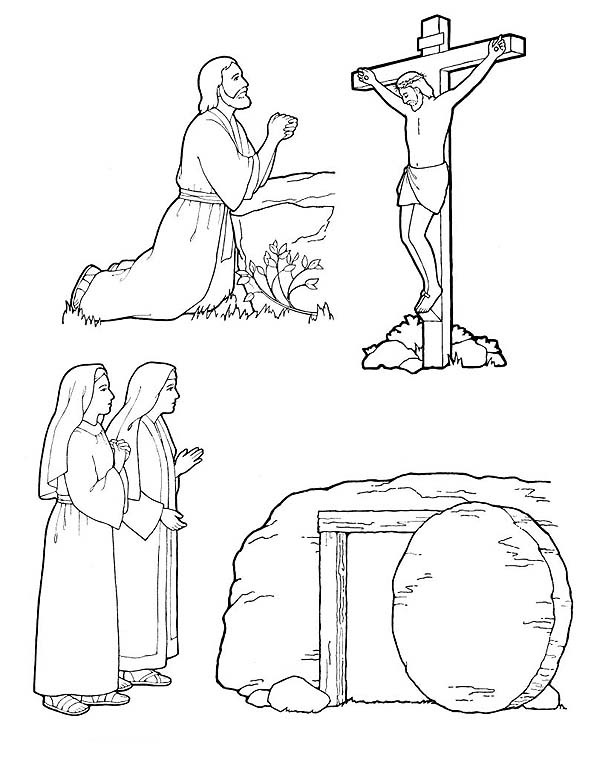 When Mary Magdalene and Mary came to visit the tomb that morning, the angel “said unto the women, Fear not ye: for I know that ye seek Jesus, which was crucified. “He is not here: for he is risen.” (Matt. 28:5–6.) The Savior was not there because He had been resurrected and He was about His Father’s business. Heavenly Father sent His Son Jesus Christ to earth to save us from our sins. If we repent of what we have done wrong, we will be forgiven because of the atoning sacrifice of the Savior. And, like the Savior, we will all be resurrected someday. Instructions: Carefully remove pages 28 and 29 from the magazine and mount (glue) them on lightweight cardboard. Cut out each booklet page, and punch the holes where indicated. (Optional: cover with clear, self-sticking paper, or put into plastic sandwich bags.) Put the pages in order, then add them to the back of the book you started last month. Use this book to tell the story of Jesus Christ to yourself, to your family, or to help you remember Him during the passing of the sacrament. 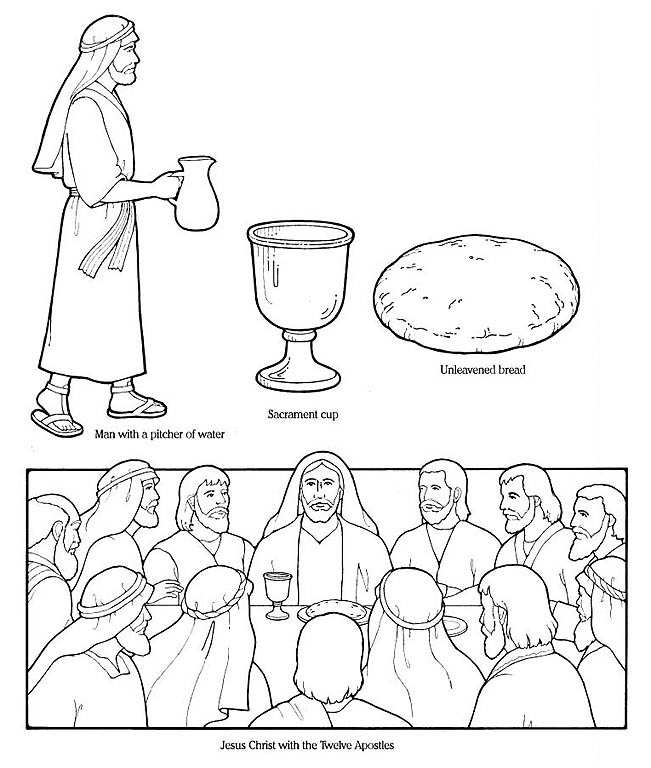 8 At the Last Supper, Jesus administered (blessed) the sacrament. 11 Jesus was buried in a tomb. 12 But on the third day He arose! 13 After His resurrection, Jesus visited with many people. 14 Did Jesus really live again after He had died? Oh, yes! And because He did, so shall we! 15 Jesus has asked that I remember Him and keep His commandments. I can do that for Him. A girl in my class wasn’t a member of the Church. Our Easter pageant was coming up, so I gave her an invitation. Her family went to the pageant. The next day when I went to school, she said her family had a good time. I felt a warm feeling in my heart for inviting them. Creating and holding onto Easter activities that reflect President McKay’s words is a challenge for all Latter-day Saint families. Such traditions can not only effectively teach gospel principles and serve to strengthen testimonies, but can also help create an atmosphere in which family members gain self-esteem—thus helping build strong family relationships. At this sacred time of the year, gospel-centered family activities should take precedence over the Easter Bunny, colored eggs, baskets, baby chicks, candy, special meals, and new clothes. On Easter Sunday, for example, Brother and Sister Douglas have their seven children ponder the question “What does Jesus mean to me?” It is a quiet morning, and at the end of the time allotted, they share their thoughts. Easter morning is a spiritual experience in this home, one the children remember. Giving children an opportunity to choose their activities gives the traditions added interest. Children are more likely to embrace an activity if they help choose it. Family prayer is given additional emphasis in many families the week before Easter, with more than usual attention given to thanks for Jesus’ love, his sacrifice, the Atonement, and the Resurrection. The members of one family set personal goals for a particular virtue they wish to achieve. Each person strives throughout the week to achieve his goal and to have a “perfect day” on Easter. The “show love tradition” is also observed in many LDS homes both at Christmas and at Easter. After discussing the great love of Jesus, family members make a special effort during the week to show the love they have for one another. He instructed the class to fill in the blanks, to carry out their service, and then to sign the card. The Blazer class responded to the teacher’s challenge with extra chores done, messages of love delivered, kindness demonstrated. The idea of doing something special for someone inspired the teacher so much that he took the challenge home to his family and discussed with them how to use it to celebrate Easter more meaningfully. They decided to visit a widower on their block, a man they had been meaning to visit for some time. When they arrived on Saturday morning with a basket of homemade cookies and colored eggs, they saw that he needed their assistance in several ways. With their renewed commitment to do good, there came an awareness of others’ needs. Their Easter service project became a family tradition and left a long-lasting impression of the joy it brings to serve others. Taking an Easter flower to grandma and grandpa is a tradition shared by many. Some families go even further and use Easter as a reason to visit the elderly and others with a bouquet of spring flowers. Holiday traditions in Bishop Darwin Thomas’s family are rich with music. Sister Thomas teaches singing, and the five children often sing in performing groups. At Easter the children have the opportunity to choose a favorite Easter song. Among those the older children like are the hymns “There Is a Green Hill Far Away” (no. 201) and “Christ the Lord Is Risen Today” (no. 10). 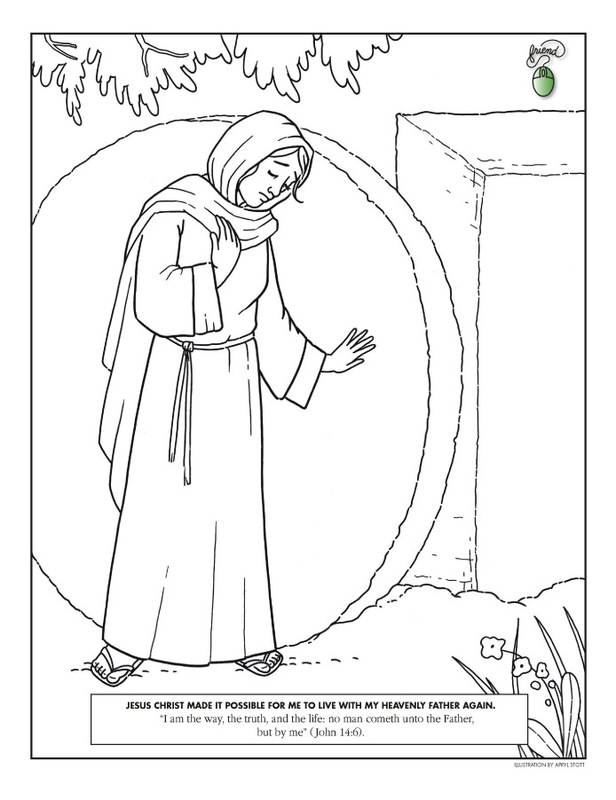 The small children often choose “Jesus Has Risen” from Sing With Me (F–17). Mrs. Grant Atkin, a mother of small children, finds that having the children’s Sunday activities centered around what they call their “Sunday study table” helps the children to be appropriately occupied. Paper, crayons, paste, and scissors are provided for creative activities. 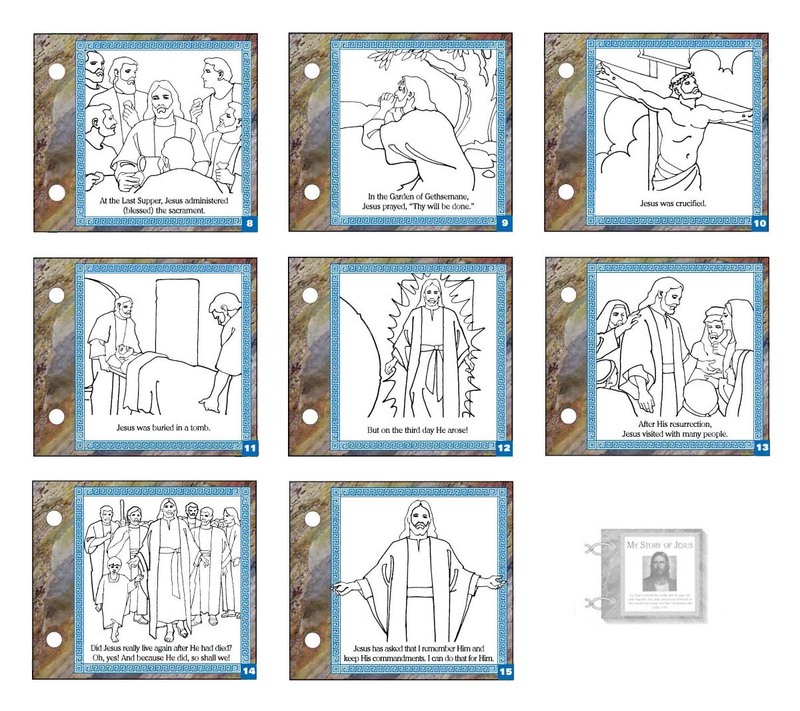 At Easter the young children color pictures that tell the story of the Resurrection. Many families find scripture reading time the best opportunity to discuss the important Easter events. Some scriptures to study the week before and then discuss on Easter are Matthew 28:1–20 [Matt. 28:1–20]; Mark 15:42–47; Mark 16:1–20; Luke 23:50–56; Luke 24:1–53; John 19:38–42; John 21:1–25; and 3 Nephi 8:5–7, 17–18, 20–22 [3 Ne. 8:5–7, 17–18, 20–22]. Food is often the center of traditions. However, many families wish to keep cooking and clean-up on Sunday at a minimum. They still enjoy the traditional dishes to which they have become accustomed, but much of it is prepared in advance. One family would meet at the grandparents’ home for dinner. After the meal, the grandmother would ask the children the meaning of Easter. The first Easter after she died, the family met for the traditional dinner, and after the meal an older child asked, “Aren’t you going to ask us the meaning of Easter?” He had been anticipating his answer to the question asked by his grandmother. The father who stood at the kitchen table one Easter morning to express his feelings also began a family tradition. He told his family how grateful he was for Christ’s sacrifice and how happy he was they could be resurrected. The father conveyed a sincere and powerful message to his family. Each year thereafter he or another member of the family would bear a testimony to the family about the meaning of Easter to them. Another father uses holidays, birthdays, Christmas, and Easter to hold special interviews with each member of his family during which they talk about their feelings for Jesus. The children in this family look forward to this holiday tradition with eagerness. Colored eggs, baby chicks, tasty food, and new clothes may be symbolic of new life. But focusing our attention on our Savior and his gifts of life through the Resurrection and the possibility for eternal life through his Atonement is the best way to make Easter a day of “divine worship” and to establish gospel-centered family activities worthy of this sacred day. Jesus Christ Made It Possible for Me to Live with My Heavenly Father Again.